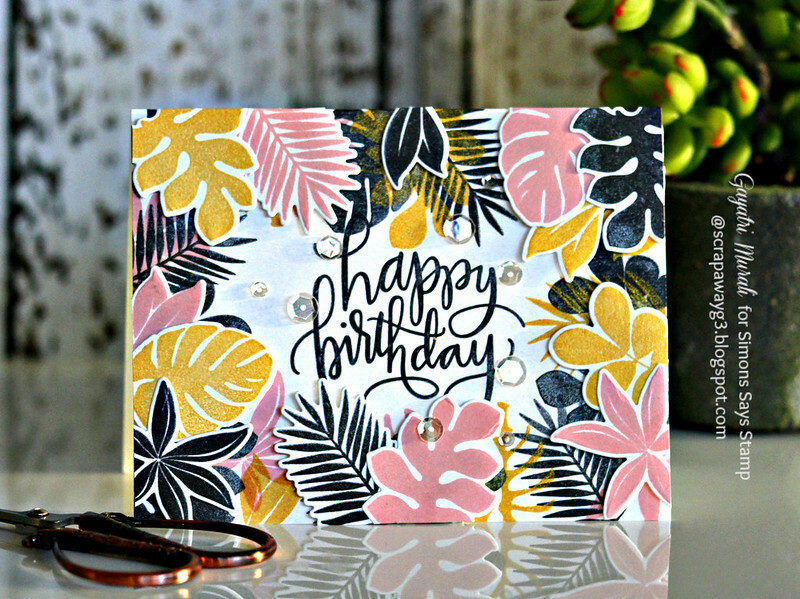 I am sharing couple of cards using SSS Tropical Leaves stamp set and coordinating dies from Among the Star collection. The moment I saw this set I really loved it and was waiting for them to arrive. When they arrived yesterday, I couldn’t wait to ink them. In my package that arrived yesterday, I had bought the new Delicata Black Shimmer. I was desperate to try the ink. 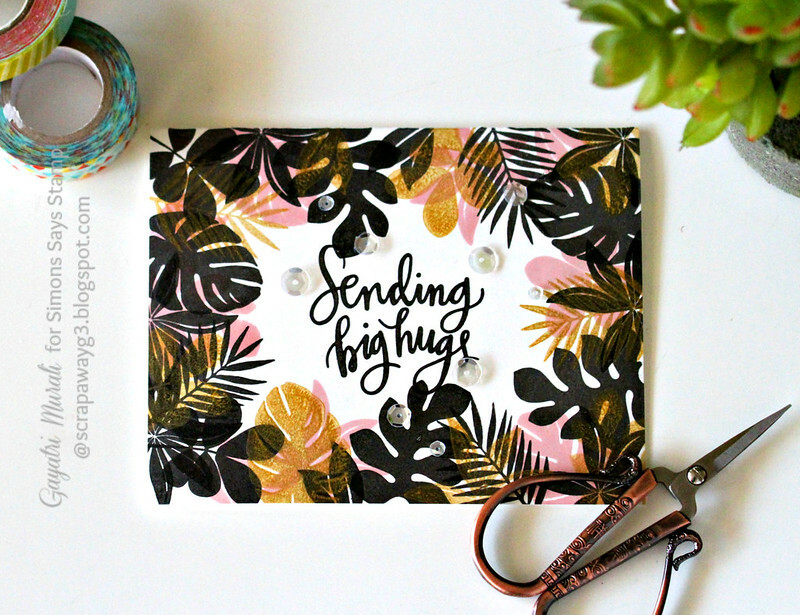 Although, I wanted to use the Tropical Leaves images in the traditional colours of greens and pinks, I decided not to because I want to use the black shimmer ink. So I went for a stylised design with black shimmer, gold and pastel pink colour combination. Also the inspiration for the colours came from the nail colours of my daughter Aditi and myself. I have Black sparkle in four of my finger nails and gold sparkle on the ring finger nail. My daughter has pink on her nails. We got them done today. Had a great bonding time! On my first card I have stamped the leaves image from Tropical Leaves stamp set using Delicata Black Shimmer pigment ink, Delicata Gold pigment ink and Simon Says Stamp Twirling Tutu dye ink. I have layered my stamped images. Because the black and gold are pigment inks, I dried each layer before I stamped the next layer. Also make sure not to smudge the black pigment ink as it takes some time to dry. 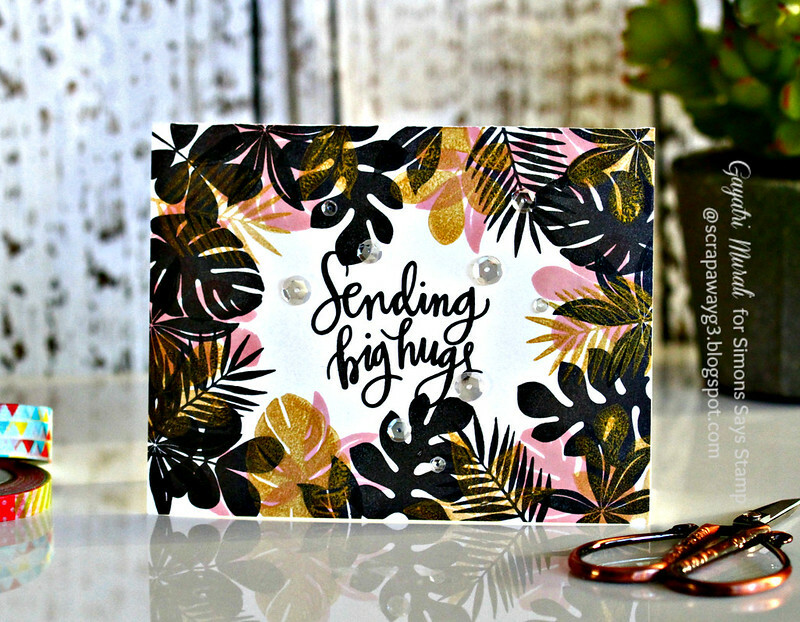 The sentiment is from Simon Says Stamp Big Scripty Greetings also stamped using Delicata Black Shimmer ink. This is essentially an one layer card except for the Sparkling Clear sequins from Pretty Pink Posh. Absolutely love the black shimmer on the card. It is subtle but just beautiful especially under the light. For the second card, I went one step further and added die cuts to give dimension. So I stamped the leaves from Tropical Leaves stamp set similar to the first card. Then I also stamped a bunch of them using all the three colour on scrap piece of paper and die cu them out using the coordinating dies. Then adhered them in clusters using foam adhesives. Trimmed off the over hangs. Stamped the sentiment from Simon Says Stamp Big Scripty Greetings and embellished with Sparkly Clear sequins. 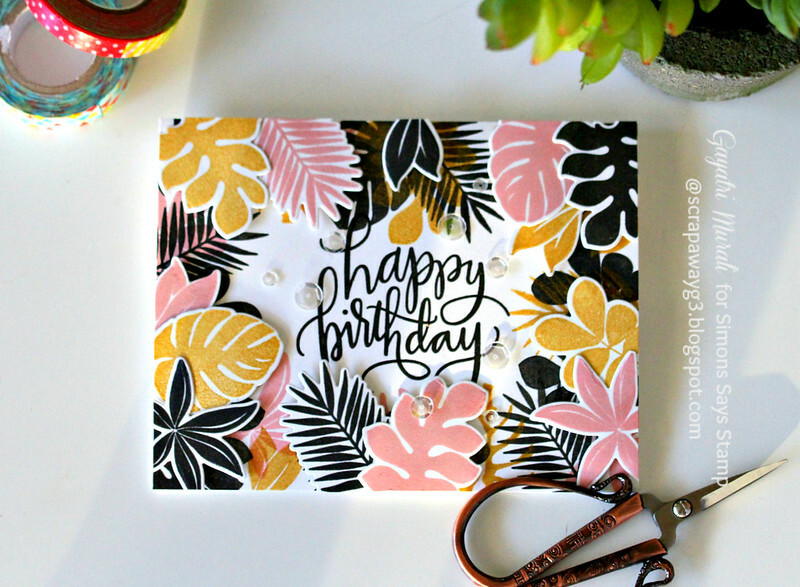 Love love the Tropical Leaves stamp set and coordinating dies and the Delicata Black Shimmer ink. Thanks for stopping by today. Have a wonderful day or beautiful evening! Wowzer–absolutely stunning cards! Love the black, gold & pink! I didn't know Delicata had a black ink, but now I will have to get it! Thanks for the inspiration!